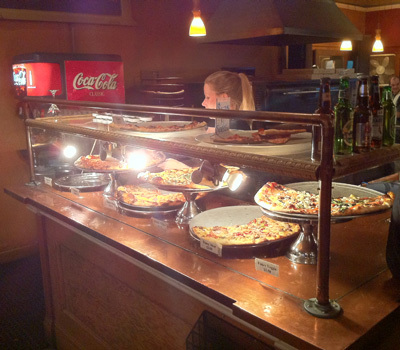 The atmosphere of Mississippi Pizza is understated and nice – it’s a clean pizza place with a separate area where they serve beer, wine and spirits. Also, they often have trivia nights, live music and other activities going on. Pizza’s one of those things that tends to attract children in droves, and though kids are definitely welcome, not having swarms of unparented children rambunctiously ruining your meal is a nice change. Portland parents watch what their kids are doing with the same intensity that the bums watch for traffic before stumbling into the street. There are no singing rats and bears, no video games, no ball pits… Mississippi Pizza is a place where grown-ups can eat pizza. And let’s talk about the pizza. Whether you come in a group, with just a few friends or by yourself there are options. A wide variety of slices from vegan to gluten-free, meatatarian to just cheese are always on-hand. If you’d prefer, you can order a full pie by selecting your own toppings or going with one of the pre-made options; Trouble (double cheese, double pepperoni and double sausage) and Aloha (Hawaiian – Canadian Bacon and Pineapple) are personal favorites. Tonight, I was in the mood for a quick bite, and this is where Mississippi Pizza truly shines. Run in, order your slice and a soda and you’ve got a quick meal for under $5. 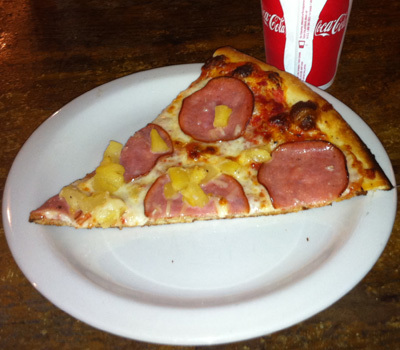 I grabbed a slice of the Aloha. The pizza crust has just the right amount of snap, and the mozzarella tastes great. The crust would best be described as being on the thinner side of regular. Not Chicago, not New York – this is Portland pizza. Mississippi Pizza truly offers everything you’d want from a grown-up pizza place – good pizza, a wide variety of beers, wine and spirits, plus the live music, trivia nights and more.